The Economist posted this video about the recent Greek vote, which was won by the pro-Euro parties. I am not nearly as pessimistic as the Economist, nor do I think many of their worries are valid. First, the Euro was always a two way street. Anything that is done by a law can be undone by a law. Countries will only keep the Euro so long as it is in their own best interest to do so, and no amount of hand-wringing will change that fact. Secondly, higher interest rates for more risky bonds is a feature, not a bug. Debt should have higher yields if it has a higher risk of default. That encourages countries to be more responsible and minimize their debt loads. 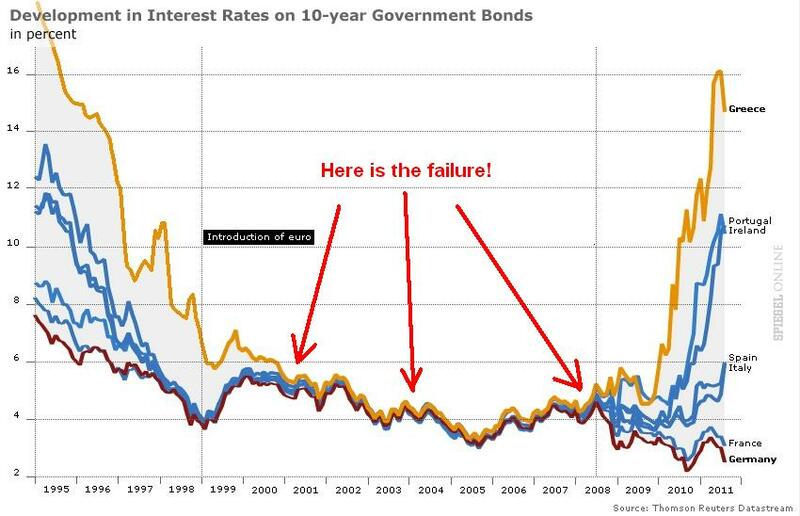 We are now seeing the consequences of artificially low interest rates now. Banks should worry about whether the loans they make will be paid back! That’s their job. No, it doesn’t. The banks will run out of money (rather quickly actually), and the run will stop. People will not get 100% of their money back, but the old accounts could be guaranteed in the new currency, just like the rest of the revaluations. The system is broken. Trying to preserve it exactly as it was is a fools errand. Something needs to give. It’s better to face that fact and try to minimize the pain than to vaguely warn people that “bad things will happen” unless everything is frozen in time. I personally favor default. People who lent to high risk countries knew there was a risk that they would not be paid back, and they explicitly took that risk. They are the ones who should bear the downside, not people who did not agree to take the risk. If there is a contraction in NGDP due to the unwinding of the money multiplier, the ECB can print more to balance it. Why does Europe treat Greece differently than the United States treats California? I think they should treat them the same. Are any comparisons between Greece and California valid? California is an economic powerhouse. Farming, Silicon Valley etc… Greece is well… just Greece. If California defaulted, I would have serious worries about the rest of the country. It would be closer to what would happen in Europe if Germany’s economy tanked. A closer comparison to Greece in the United states would seem to me to be a place like Arkansas defaulted. Not nearly as catastrophic, but symptomatic of greater economic difficulties. Sure there are differences, but that just makes the point stronger. If the U.S. can let California default with virtually no negative spillover effects, surely the EU can let Greece default as well. Banking contagion can be dealt with through speed bankruptcy, decimation, or whatever the governing country deems fit.